DC Comics, publisher of graphic novels starring Batman, Superman and a host of timeless characters, has launched its entire portfolio of weekly titles on the major digital book stores. Brand new weekly editions are now available to download and keep through Amazon's Kindle Store, Apple's iBooks Store and the Barnes & Noble Nook Store. All DC and Vertigo comics, including the likes of Justice League, Wonder Woman, Green Lantern, Detective Comics and Action Comics will be available on the same day the paper editions go on sale. The titles were already available to purchase digitally through the dedicated DC and Vertigo apps for iPhone, Android and from the readdcentertainment.com site before they also arrived on the ebook stores. By launching weekly titles on the three major digital book stores, DC has beaten rival Marvel to the punch. The publisher said its all about convenience for users. 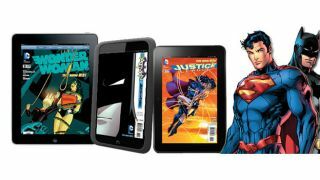 "As e-readers and tablets continue to explode in popularity it's important for us to offer consumers convenience and choice in how they download digital comics," said Jim Lee, co-publisher, DC Entertainment. The titles, which join the existing trade issue collections, are all available to download now from the respective ebook stores.